The waterlogged East End Park pitch. 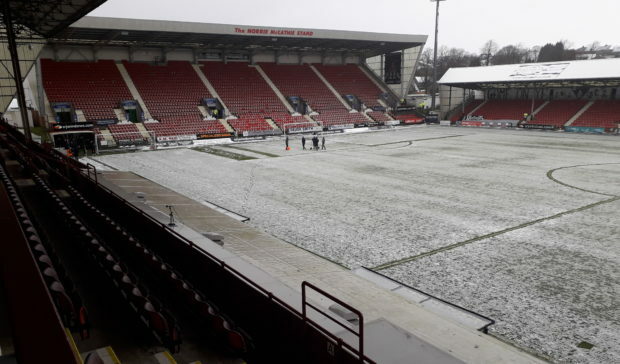 Dunfermline have apologised following the late postponement of their Championship game against Dundee United. The match was called off after a pitch inspection by referee David Lowe at 1.30 with the East End Park surface waterlogged. Heavy snow and rain had fallen throughout the day but there had been no prior indication that the game was in doubt. The United players and management had already arrived at the ground by the time the match was postponed and they quickly turned round to head straight back up the M90 on the team bus. Initially, no-one from the Pars was available to comment but the club later issued a statement saying: “Following the cancellation of this afternoon’s match against Dundee United, DAFC would like to apologise to all home and away supporters who have been inconvenienced by the call off at 1.30pm. “Our ground staff and officials have been in since 8.30am this morning, and we have been in dialogue with the SPFL since then. “The weather conditions proved extremely difficult to predict, with snow, sleet and then rain causing our pitch to ultimately become waterlogged, despite preparatory work being carried out yesterday. “We requested the match referee to attend early to inspect the pitch, and at that point he had unfortunately no other option than to cancel the match. United had hoped to pick up points against Dunfermline to close the gap on Ross County – whose own game on Friday at Inverness was also postponed due to a waterlogged pitch – at the top of the league table. However, the two sides will now meet at Tannadice on Tuesday night with the Staggies still 11 points ahead of the Tangerines.